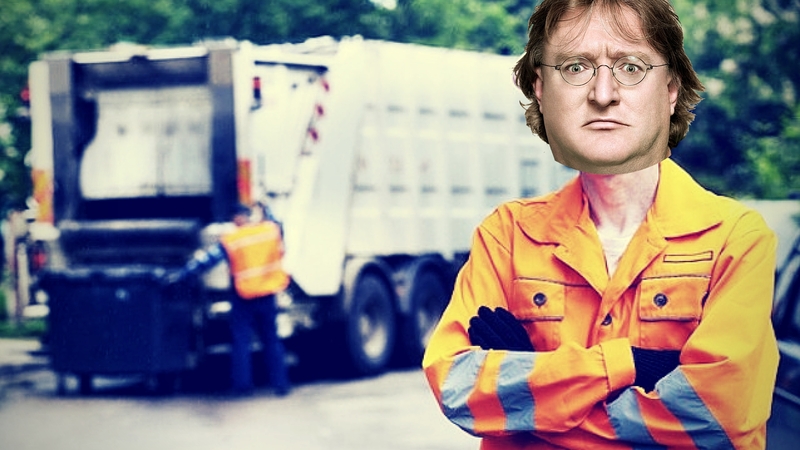 With its latest cease and desist letter to all CS:GO (and one Dota 2) betting and gambling sites, Valve is taking out the trash. The CS:GO gambling situation had developed quickly in the last few weeks. After our previous article on the original TmarTn and ProSyndicate conspiracy, Richard Lewis uncovered another scandal between PhantomL0rd and his website CSGOShuffle. PhantomL0rd’s twitch account has since been banned, and the whole situation is extremely shady, if not illegal. Still, today’s news probably blows that out of the water. 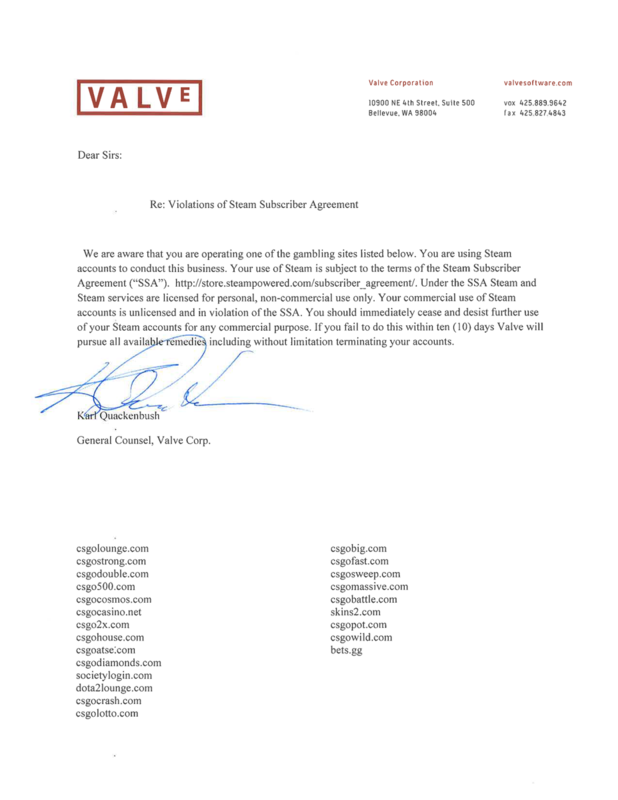 A few hours ago this letter by Valve surfaced. It has been confirmed to be legitimate. Apparently sent to the various gambling and betting sites listed, the letter from Valve is basically a cease and desist to these sites, for violating Steam’s Subscriber Agreement. Note that the violation doesn’t specifically mention betting, but mentions that running trading bots with Steam accounts not associated to actual people. Notable sites on the list includes CSGOLounge, Dota2Lounge, and CSGOLotto (from the previous TmarTn gambling scandal). Notable sites that haven’t been listed include Dota2Wage, Dota2BestYolo, Gosubet and the Chinese CSGO and Dota 2 betting site VPGame. 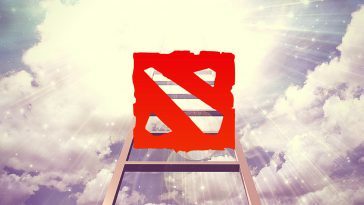 We don’t know why Valve hasn’t chosen to list them in the letter, though it’s probably because the main gambling scandal focuses mostly on CSGO and the only Dota 2 betting site on the list, Dota2Lounge is owned by the same people that own CSGOLounge. 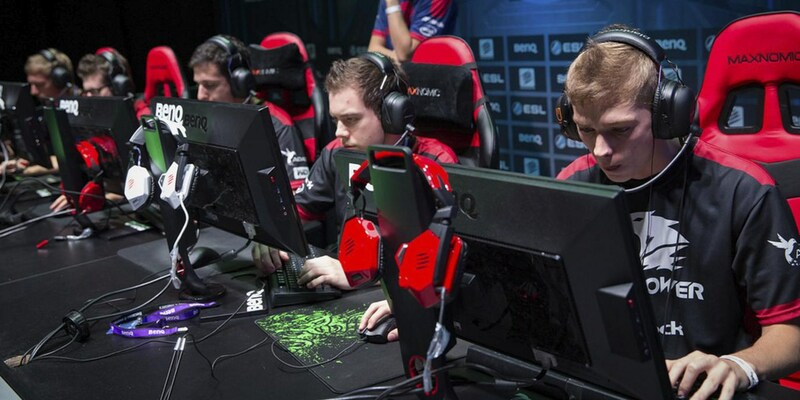 Dota 2 and CS:GO betting is kill? It would seem so. There’s no reason for Valve to not go through with their termination of the bot accounts should any of the sites choose not to agree. From now on item betting would change forever, possibly being replaced by betting real money or site-specific items similar to Gosu’s branches. If you have any items currently sitting in any of these sites, now’s the time to withdraw them. For one, the Dota 2 and CSGO viewerships on Twitch streams and major tournaments will probably take a hit. More so on Dota 2 than CSGO because the majority of Dota 2 betting happens with item bets instead of real money. The biggest victim of this change would be smaller tournaments who were either sponsored by betting websites, or whose viewship largely depended on people who would bet and watch the matches. 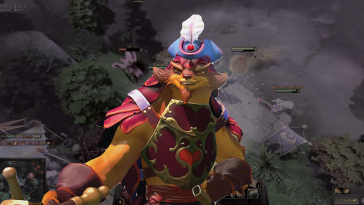 In Dota 2 especially, a majority of item bets take place from the SEA region, where low value item bets are the norm. It’s slightly different for CS:GO where bets are more spread out across regions and a lot of them bet with real money. Expect a slight decrease in viewership. With the removal of item betting, match-fixing scandals in the future are going to exit the murky grey area of “item bets” and move on to felony-tier match-fixing violations. Valve has made it clear it doesn’t tolerate match-fixing, with the removal of Arrow Gaming’s Dota 2 squad in 2014 and the famous iBuyPower team in CSGO. But it also poses an interesting question about the legality of Valve’s lifetime bans, especially on the iBuyPower team, considering it was the first of its kind to ban a star studded quad for life in CSGO without any previous precedent, could be looked at again. Does the legality of betting sites in general have any affect on match-fixing with items only? The iBuyPower supporters now have an interesting question to ask about whether the bans should be lifted, seeing as item-betting itself is illegal according to Valve, but they didn’t do anything about the sites being bet on back then. Hypocrisy, or simply company policy? We’ll have to wait and see. So far, all the information we have is a cease and desist letter, but all signs point to this being the end. This is probably not the last we’re going to here of gambling and betting in CS:GO, as there are major developments seemingly everyday. It seems that Valve’s class action lawsuit, h3h3productions and Richard Lewis along with tons of other people in the scene have driven Valve to taking out the trash.